Yes, We Are Open in theWinter! Our Top Nine Reasons Seward is Not-to-Miss this Winter! Shorter Days Mean Longer Sunrises & Sunsets! During the winter months the sun is lower on the horizon, which means long hours of absolutely amazing light. Winter in Seward is a photographer's, whether you're an expert or a novice. Hiking, Biking and Skiing the Trails, Mountains & Roads ! There are so many options to get out and explore! Exit Glacier Road is closed to vehicular traffic in the winter, but it is open to cross-country skiing, snow shoeing, snow biking, snowmobiles and mushing teams. Visit Kenai Fjords National Park in a way very few people see it, covered in winter snows! Many of the trails located between Seward and Moose Pass are great for winter snowshoeing or cross country skiing, and the Seward Nordic Ski Club even grooms trails at Divide Ski Area (Mile 12) and at the Trail River Campground. Most trails will allow dogs, so you can get out and explore with your favorite furry friends! Take a stroll along our Beaches, Boat harbor or Streets! Walk our waterfront path, explore the side streets of Seward, explore Lowell Point Beach or meander the docks of Seward's Small Boat Harbor. Fresh snow really brings out the beauty of Seward! Stay Warm While You Visit the Alaska Sea Life Center! The ASLC is the perfect hideaway for chilly days! Best yet, every Wednesday is 'Free-zing Wednesday' and entry is free for Alaska Residents. The ASLC is open daily from 12pm - 5pm. Visit Local Shops & Restaurants for Holiday Shopping! Seward has a ton of local stores, art galleries, restaurants, a unique library/museum and beautiful decorations over the holidays. Sip coffee in a historic church, peruse handmade jewelry, relax with a massage or pedicure and enjoy fresh fish or oysters over lunch. Get Out and Explore Resurrection Bay! Did you know you can kayak or take a boat tour all winter long? Sea kayaking in Resurrection Bay on calm winter days can be a really special experience! If a motorized experience is more your speed take a boat tour through Resurrection Bay looking for orcas and eagles. Check out our winter activities page for more info! See Brave Souls Jump into Resurrection Bay...in January! Each year Seward hosts the Polar Bear Jump into Seward's Small Boat Harbor to raise money for the American Heart Association. Watch hundreds of brave (crazy?! 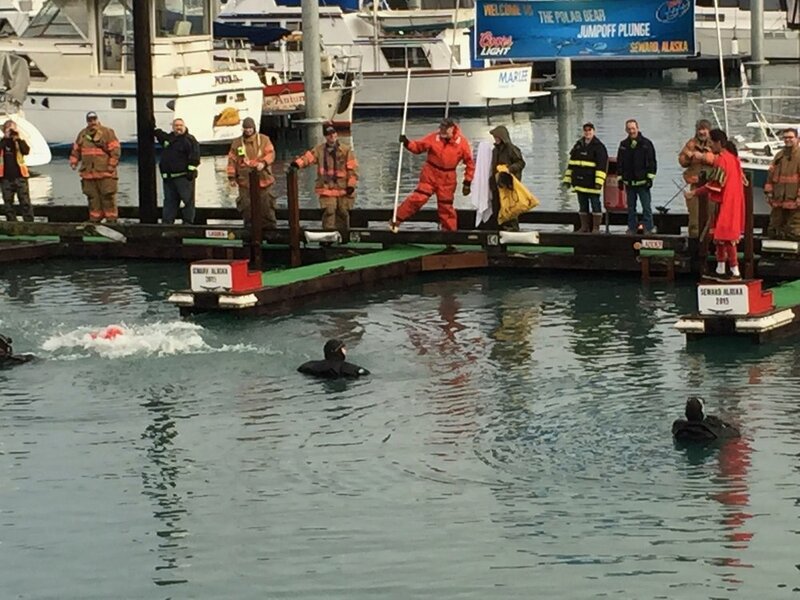 ), costumed folks jump off the docks to raise awareness and funds. The weekend long event includes the Jump, a parade, quilt show, soup and steak feeds, winter carnival and turkey bowling! Take in a Friday Night Movie...for $2! Seward is lucky enough to have the Skip and Marie Fletcher Winter Family Movie Series hosting pre-CD release movies every Friday. The early film is a family friendly flick, while the later showing tends to be a more adult oriented film. Each movie is only $2.00 and popcorn, candy, snacks and drinks are only $1.00 each! Or, Just Cozy Up in Your Cabin! Sleep in, watch a movie and sip hot chocolate while cuddled up with your family. Don't forget to bring your four-legged cuddle buddy! Are YOU Ready for a Winter Visit to Seward? Head to the comment section below and tell us what you plan to do with your winter visit to Seward! Looking for a Winter get away? Give us a call or email us at info@serenitybytheseacabins.com to see what we have available. How about a paddle to a Glacier! We are tucked in the woods just 1 block from the beach. For those of you that love winter ask us about our winter rentals. Stop in and see the animals, learn about the Stellar Sea Lions, the Harbor Seals, Harlequin Ducks, Common Murres (many people mistake these little ones as penguins, but of course as you know there are no penguins in Alaska), Tufted Puffins and lots more. This is a great place to spend the day! This is a great place to get tons of info. about our area. There is info. about Cruising, Exit Glacier, park info, and much more.